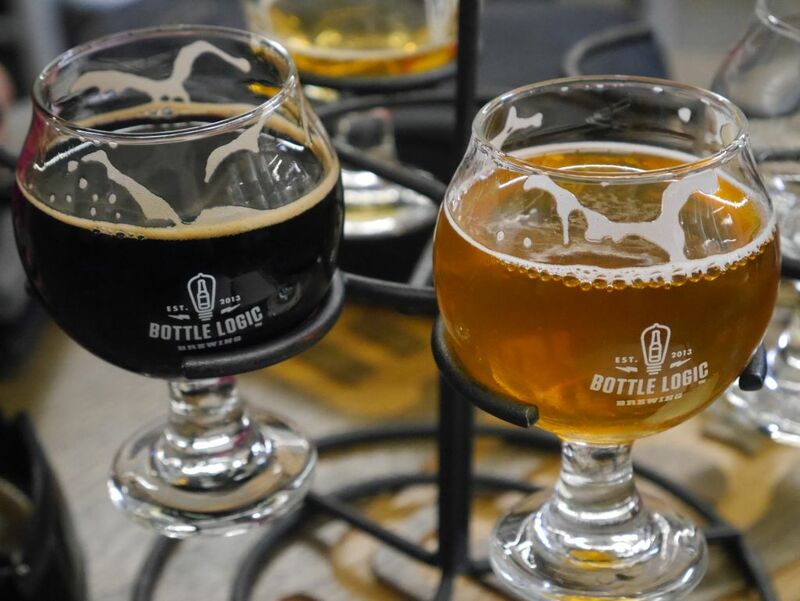 Quite close to Noble Ale Works and still not far from The Bruery is a brewery I hadn’t heard much about called Bottle Logic. I got a certain feel similar to the experimentation present in Beachwood Brewing. They give you a nice preview of things that are currently fermenting so that you can have an idea of what is coming next. 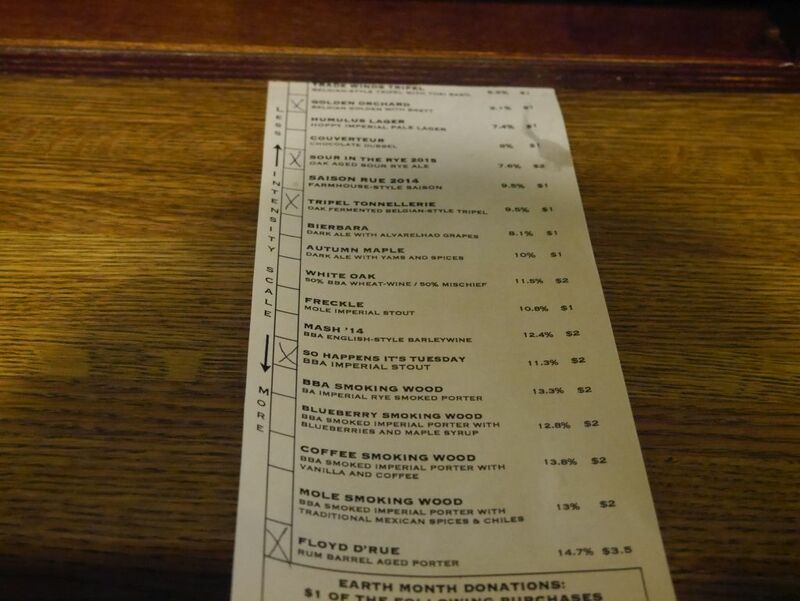 When I stopped by I ordered a flight of most of their core beers and a few others. Some of the beers were quite impressive though others were merely good. 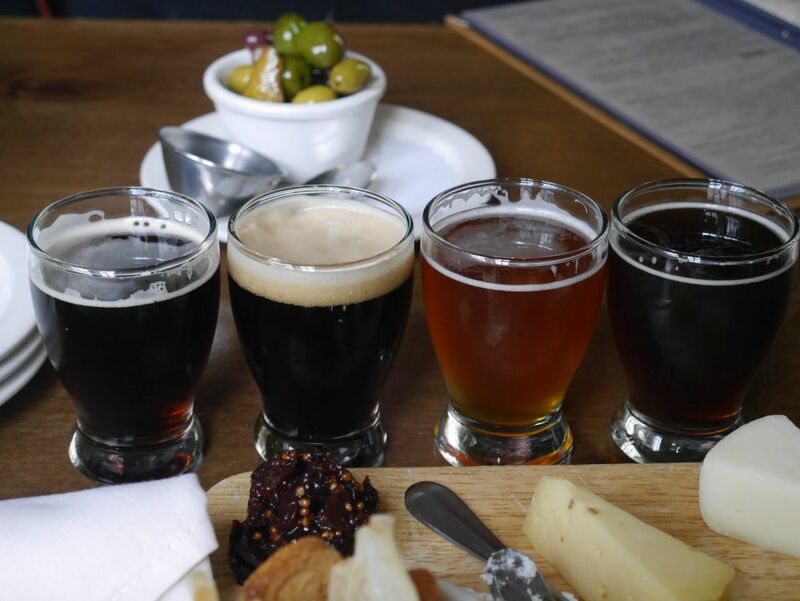 I started with a flight of the Tattered Prince French style saison, the Lagerithm dark lager, Recursion IPA, milk stout, Berliner Weisse with peach and hibiscus, and the baltic porter. I finished off with a taster of the Double Actuator double IPA and Imperial Coffee Stout. Starting things off the Tattered Prince I really enjoyed the tropical fruit and belgian yeast flavors mixing with the various spices that are typical in a Saison. It packs a good punch at 7.3%. This beer recently won a few medals and I can see why. I almost left with a bottle. Next came the dark lager. It was a solid beer with some light coffee flavors and roasted malts. It would be very refreshing but I was hoping for something closer to a Czech style black lager. It was more of an amber lager. The Recursion IPA was a solid juicy/melon IPA with some strong bitterness and mild herbal notes. As I got through the taster the herbal aftertaste became a bit much for me. The milk stout was very smooth and had plenty of roasted malt flavors. Everything was more silky because it was poured on nitro. The Berliner Weisse was refreshing and not too tart. The peach and hibiscus blended together nicely giving it a very light pink color. This was listed as a refreshing summer beer and I agree it was. The baltic porter was also quite nice, and a bit more flavorful than the milk stout. It had some smooth chocolate flavor and light booze that blended nicely with a subtle hazelnut flavor. The imperial coffee stout was not much stronger than the porter but it had a very strong coffee flavor that was quite nutty. This was my favorite dark beer of the bunch. Finally the Double Actuator double IPA was a powerful IPA with citrus, tropical fruit, and melon and just the right amount of malts to balance it out. This one was also quite delicious and my favorite of the two IPAs. Nice wide open area to sip your beers in the back. 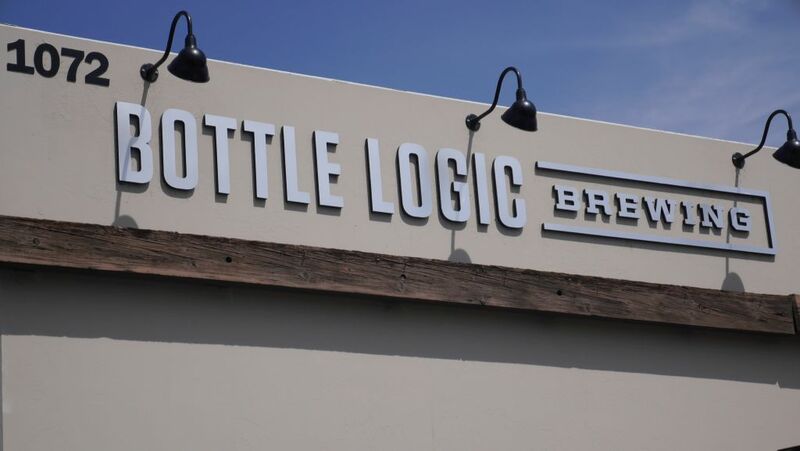 Bottle Logic has a fairly large tasting room with seating in the area with the bar and additional seating in the back by the fermenters. When I visited on a Sunday afternoon they had a food truck on site and I expect they have food trucks fairly regularly. Back when I first visited The Bruery I indicated that they made some solid sours but didn’t try any of them. At that time I wasn’t interested in sours and wouldn’t have tried them if you paid me. Now that I have grown to appreciate sour and brett beers I stopped by The Bruery recently when I was in town and got to try some of their new offerings. For a look at some of the core beers and my general overview you can check out my original post. 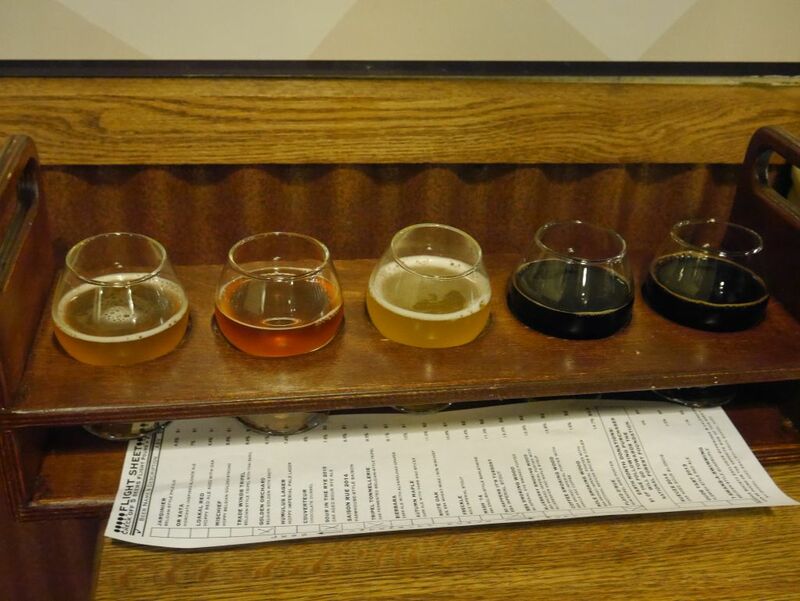 For this visit I made sure to try as many of the specialty beers as I could. For my taster flight I tried the Golden Orchard Belgian with Brett, Sour in the Rye, Tripel Tonnellerie, So Happens It’s Tuesday bourbon barrel aged imperial stout, and Floyd D’Rue, a rum barrel aged imperial porter. The Golden Orchard immediately grabbed me with the delicious sweet and fruity flavors mixing tropical fruit with the Belgian spice. I picked up a bottle of this when I left because I was so impressed. The brett yeast added almost zero funk and instead enhanced the delicious fruity flavors. Next came the Sour in the Rye, an oak aged sour rye ale. I really enjoyed the combination of mild tart with dark fruit and caramel. Everything was mellowed out nicely by the oak barrel. This one is also available in bottles, though they were a bit more expensive than I wanted to spend. The price is pretty typical for sours though. Next came the Tripel Tonnellerie, an oak fermented Belgian Tripel. This was a tasty tripel with nice mild caramel flavors coming from the oak. If they hadn’t had the next beer on tap I might have ordered more of this. I was glad to see So Happens It’s Tuesday on tap, a popular bourbon barrel aged imperial stout. Bottles of this beer are limited to reserve club members so other than trading or going to a bottle share this is the only way to taste it. The beer was thick and sweet with caramel flavors and sweet bourbon. It was so delicious that I barely got a taste before my husband finished the 2oz taster. We ended up ordering a 10 ounce pour of it to share before leaving and savored every drop. Thankfully my husband didn’t have much to drink and could drive me after that powerful beer. Enjoying some So Happens It’s Tuesday. This visit ended with the Floyd D’Rue, a rum barrel aged porter coming in at an impressive 14.7%. With a beer this strong I wasn’t surprised that it was pretty boozy. The flavors of various spices from the spiced rum barrel dominated, especially cinnamon and cloves. Compared to the previous beer I wasn’t very interested in ordering more but I did enjoy experiencing something aged in rum barrels. 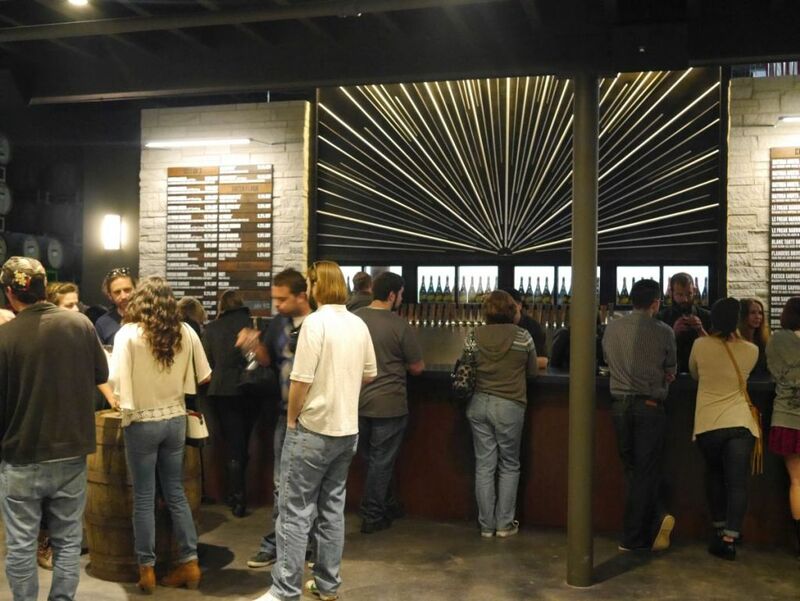 The tasting room was packed as expected! There were a few other tarts available on tap that I tried a few days later but I didn’t end up taking notes. 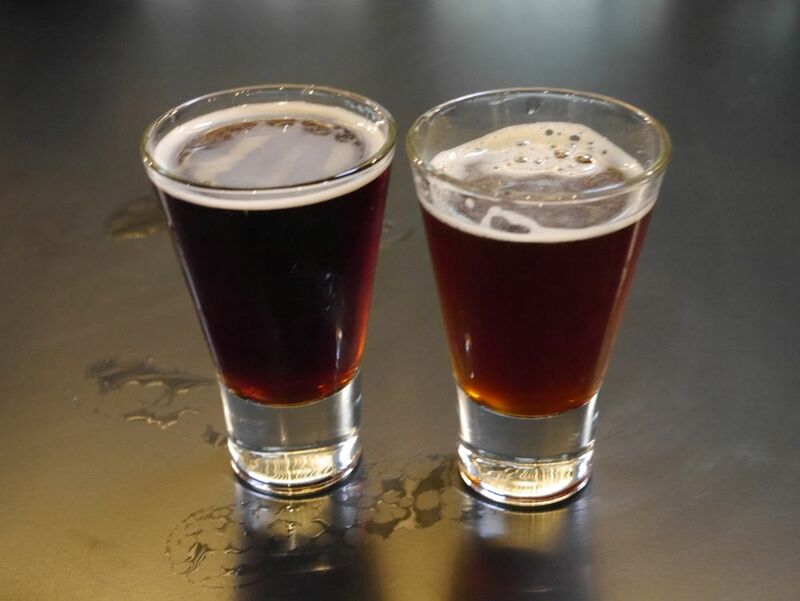 I do remember really enjoying the flavors of the Oude Tart (2013) flanders red ale and the Rueuze (2014) Gueuze. Both of these were available as a special for Earth Day with some of the proceeds from each sale going to various charities. Visiting The Bruery ready to enjoy the beers they are known for leads to a much more enjoyable experience, though it still tends to be so crowded in the evenings on the weekend that you have a hard time finding a place to set your taster flight. 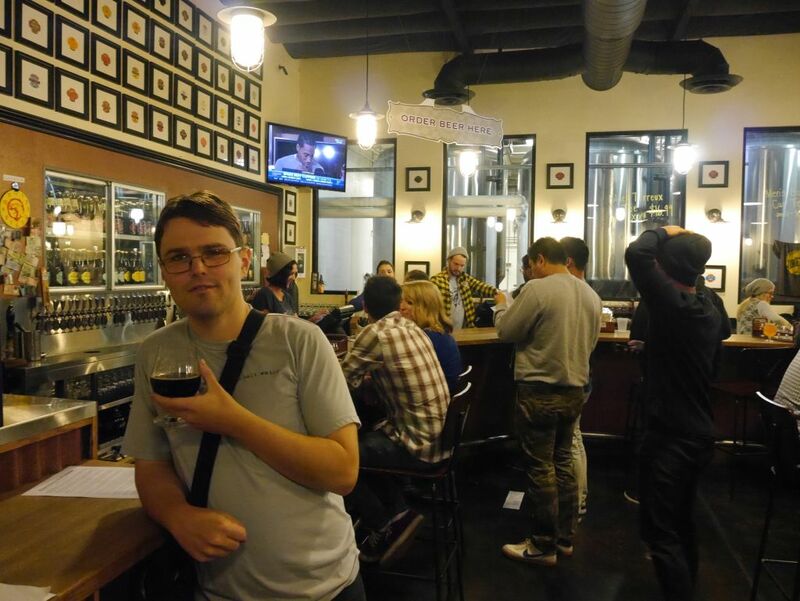 Disclaimer: My brother recently got hired as a beer-tender at the new Green Flash Cellar 3 location so I got to taste the beers listed below during the friends and family preview day at which they did not charge us for the beers. 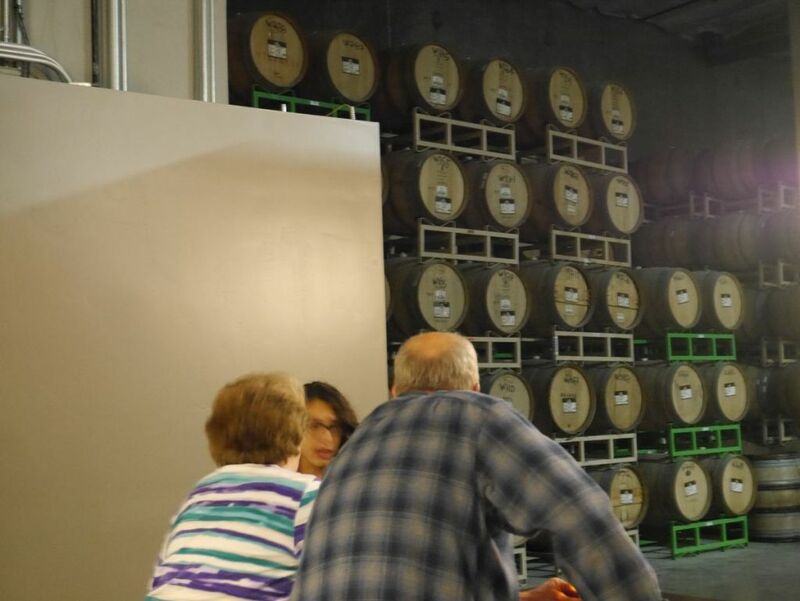 Cellar 3 is a new tasting room Green Flash opened in Poway (just a few blocks away from Lightning Brewing) where the majority of the beers on tap are barrel aged in some way or enhanced with the addition of fruit and/or brett yeast. They just had their grand opening on May 16, 2015. 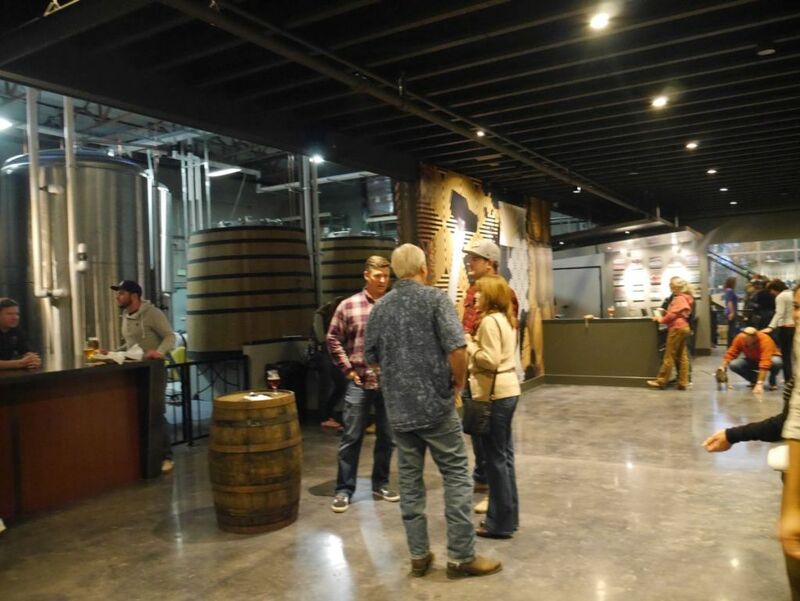 The indoor location has a very nice modern feel with various artwork on display and plenty of open space and barrels to rest your beers on. You can see many barrels in the background where beers are aging away. There is also an outdoor seating area where you can sip your beers outside or order food from the house food truck. Food available from the house truck here is slightly different from the food available at the main tasting room. View of the bar from a distance. If you aren’t interested in the sours on tap (which make up a majority of the barrel aged beers) there are still some taps with core beers. Because I tasted a total of sixteen new beers (though one or two were available when they released Silva Stout at the tasting room earlier this year) I won’t go into the specific tasting notes of every single beer. Instead, I will focus on describing some of the more interesting beers they had available and some of the beers that I found most delicious. One set of beers available that I found interesting was the Natura Morta flavors of mildly tart fruity beers. For the opening they had available a plum, strawberry, blueberry, and cranberry version of Natura Morta. I found the cranberry and blueberry versions a bit off with a wet blanket flavor that overpowered the fruit. Of all of these I enjoyed the strawberry the most because it had a nice sweetness that mixed well with the mild tart flavors. This was distinctly different in flavor from the strawberry beers that I had previously at Toolbox and Intergalactic, which both shared a more cloying sweet flavor. The flavor of the plum was not distinct enough to excite me. First three flavors of Natura Morta that I tried. Plum, blueberry, and strawberry. I was also glad to see the Flanders Drive flanders red return along with a cherry version. The version available during the opening was more on the sweet side but had a nice mix between the malts and the bourbon flavor from the barrel aging. I was not as much of a fan of the cherry because I thought that it clashed a bit too much with the bourbon barrel flavors. The Flanders Drive was one of my favorites of the new beers. Flanders Drive and Flanders Drive with Cherry. If you had Super Freak before they are now calling it Le Freak Barrique. This wine barrel aged beer with brett yeast added is a nice addition to the lineup though previous versions were much more tart. Those looking for something tart will enjoy the black currant version, which was quite tart, surpassed in tartness only by the Blanc Tarte, a unique sour blonde ale with a delicious balance of sweet and tart, and probably my favorite of the whole lineup. Also available was a white IPA aged in Chardonnay barrels that was very much like drinking a glass of wine. I was surprised that this one was not tart at all compared to an intensely tart similar beer that was available at the main tasting room a few years back briefly. They also had available red wine barrel aged dark ale that was both quite smoky and mildly tart, an interesting flavor combination. There was also an interesting new Belgian Trippel with Brett yeast that was delicious and sweet on its own and served in a red wine barrel aged and bourbon barrel aged version. The red wine aged version was mildly tart and still quite rich. The bourbon barrel version was quite sweet, almost caramel-forward and very nice as well. For those not interested in sours or Belgians they also had the Silva Stout on tap and available with plenty of bottles. This blended barrel aged imperial stout is quite delicious on its own and they had a fresh batch of the extra strong coffee added version that packs a whopping 13%. Cellar 3 will also eventually see the return of the Rayon Vert with brett yeast and from the bottles on the wall we should see a bottle release of the Le Freak Barrique and Flanders Drive in the future. 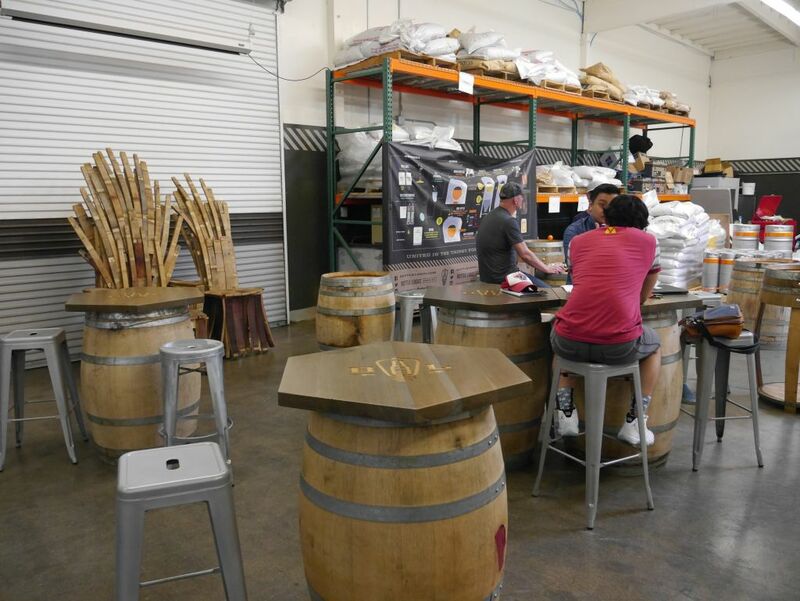 Though it is quite a bit out of the way and not particularly easy to reach during weekday rush hour traffic I expect it will become a regular for those in San Diego who crave sours or have come to love the wild yeast beers. Duck Foot Brewing grew out of a desire of one of the brewers to make beers he could drink. 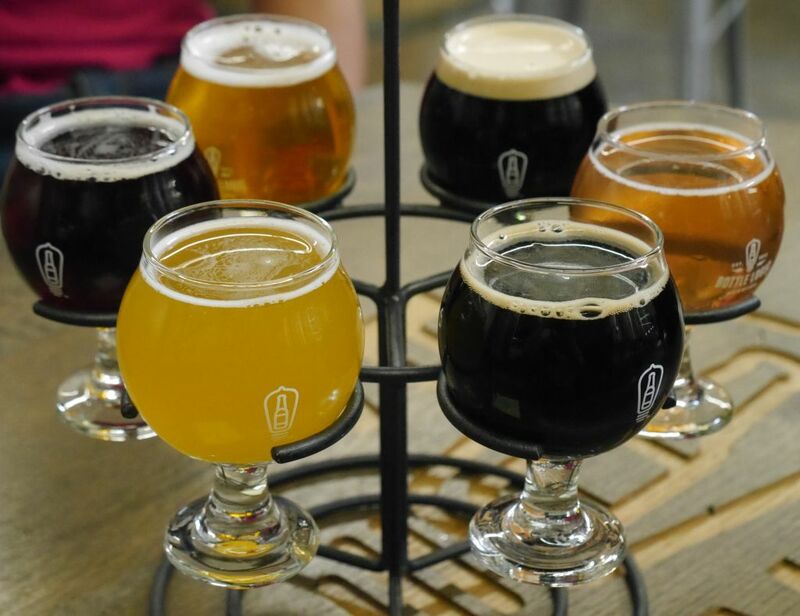 As someone with Celiac, a disease that makes gluten harmful to consume, he wanted to open a brewery where all the beers are safe to consume for someone like him. Though this is not the first brewery to add the enzyme that makes the beers gluten reduced–Stone used it in their Delicious IPA–they are the first brewery to use that inclusion as a central piece of their marketing. Duck Foot is currently in the soft opening phase and when I visited them on Saturday, May 9th, it was the first day they were open to the public. Still, I enjoyed most of their beers and will be looking forward to seeing the sorts of things they come up with going forward. 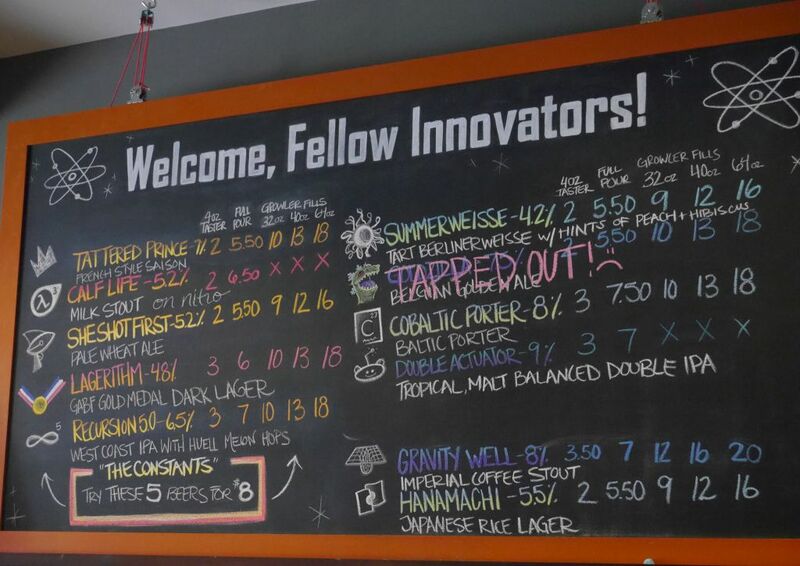 When I visited I got to try the blonde, wit, porter, IPA, and Double IPA. There was a stout available earlier that day that blew (ran out) before I got to taste it. The blonde had a nice light citrus hop flavor that balance with the typical flavors of the style. Still a very crisp drinkable beer. The wit was also nicely done to style. It had nice crisp citrus and spice flavors as you would expect. The porter had a nice mix of bitter chocolate and coffee with a nice sweet caramel back. There is also a smooth nutty flavor in the back from some added hazelnuts. I thought this one could be a little thicker but it is solid. First few tasters of the flight. Blonde, Wit, and Porter. The IPA was a nice Simcoe IPA and not overly bitter. It had good citrus flavors and tropical fruit with a moderate bitter after taste. The Double IPA was a bit sweeter with some tropical fruit flavors and good citrus. 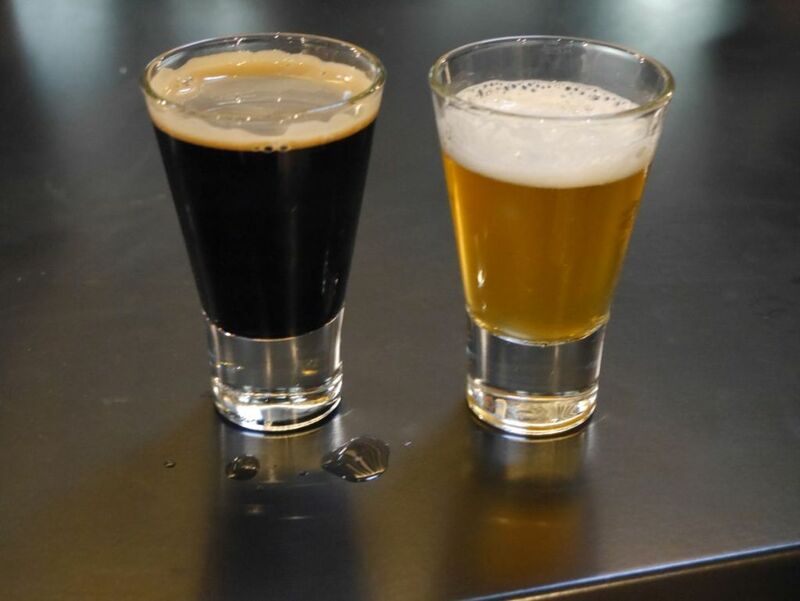 Both were very much in the San Diego style both in the flavors presented and the lighter malt bill giving the hops a prominent spot in the beers. For a new place I was also quite impressed by the size of the tasting room. 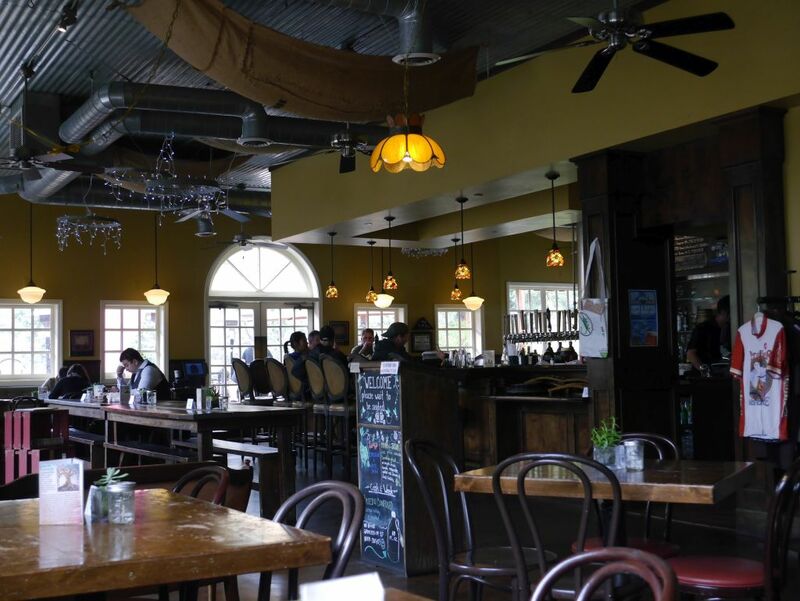 They feature a long bar and more bar seating near the windows. Indoors they are somewhat similar to 32 North in look though they feature some unique artwork on the wall that will help them stand out from the rest. All of the beers I got to taste will be core beers except for the wit. As they get closer to the grand opening I will update you on the different beers I get to try from Duck Foot. 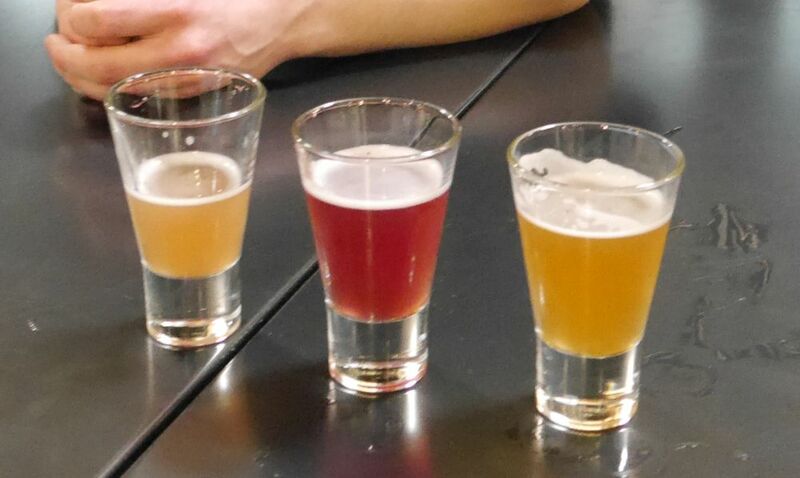 Disclaimer: I was given the tasters of beer free of charge when I stopped by for my tasting. I did not modify my thoughts in any way because of this. I came back to Duck Foot for their media party that took place on June 2, 2015 when I tried three new beers that were not available previously. These were the Cali Honey Ale, Saison, and Red Ale. I thought the honey ale had a nice balance. It was not too sweet or medicinal like many honey ales get. 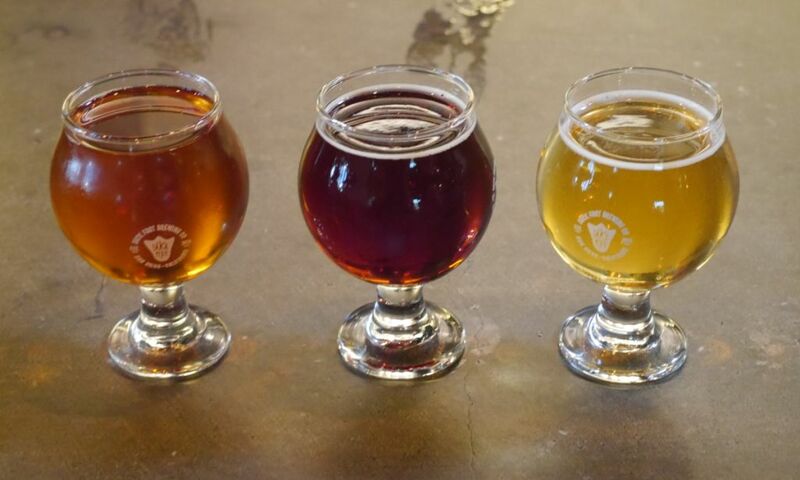 Left to right (Honey, Amber, Saison). The saison is a solid basic saison with a light body and some Belgian yeast flavors. It lacked the typical spice of a saison but they mentioned that it will be available in different fruit variations going forward so they wanted to keep it simple. Finally the Red Ale was a nice dark amber color with flavors of roasted malts and light coffee. If it had a thicker body it could have easily passed for a porter. A very nice beer. 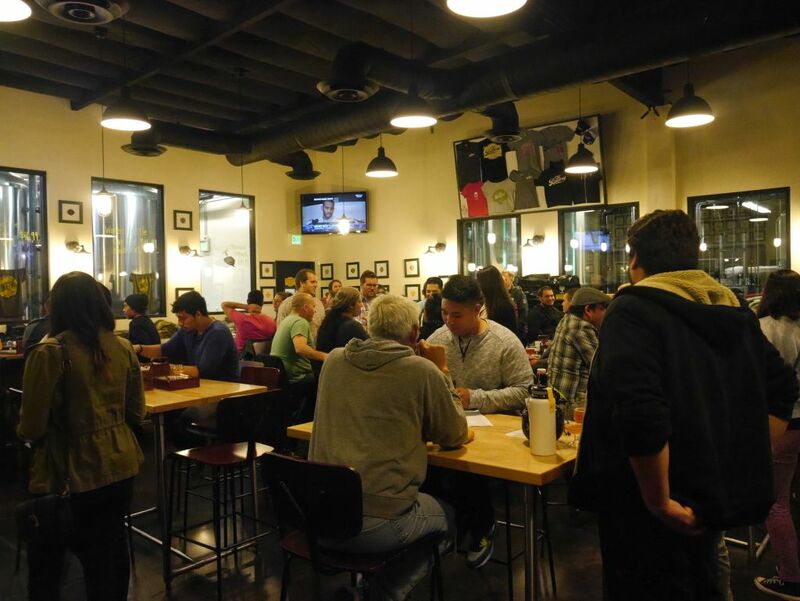 The various breweries in Los Angeles County are so spread out that it can sometimes seem like they are in different cities. 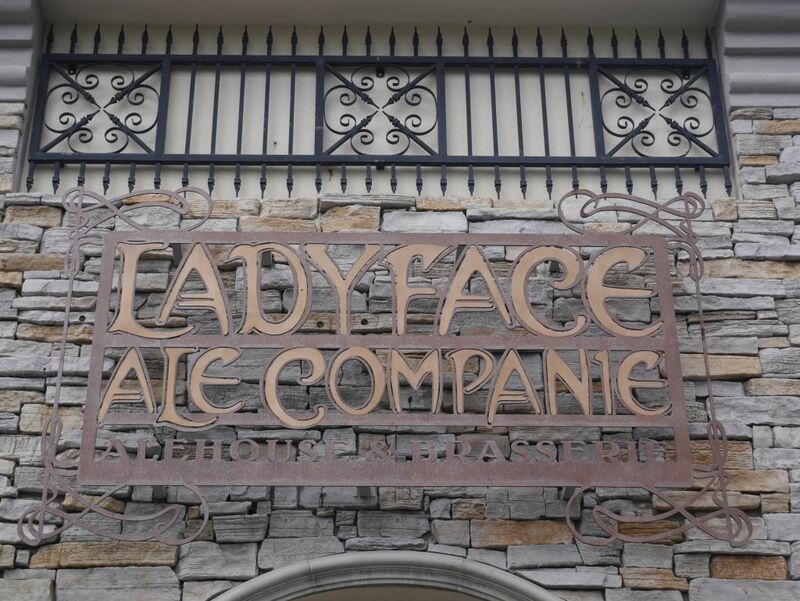 On my recent trip to LA I drove out to Simi Valley to visit a friend and we decided to meet at Ladyface for an early snack and a few beers. Being early in the day and planning on visiting a few other places later I decided to stick to the four archival ales available. 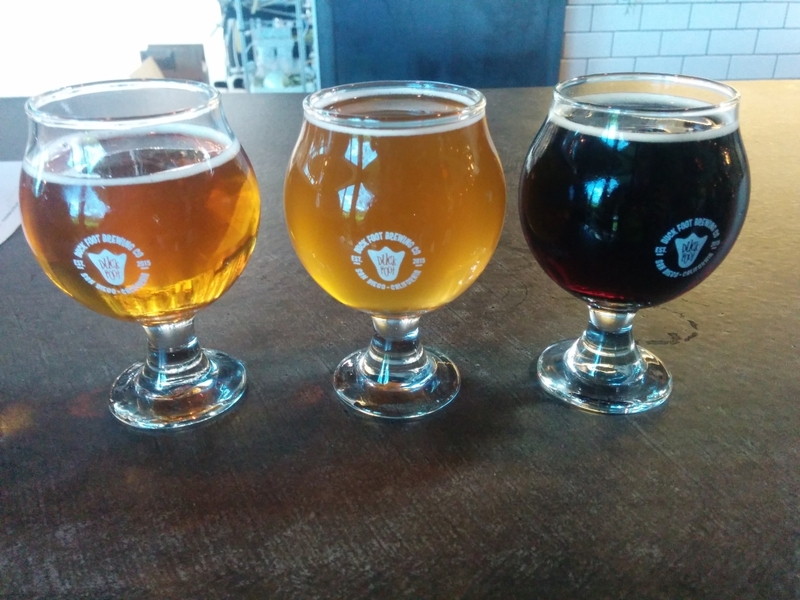 I tried the Barrel Aged Porter with Sour Cherry, Dérailleur Bière de Garde, Verrückt Weizen sour Weizenbock, and 5th Anniversary Ale Belgian dark strong ale aged in red wine barrels. I started with the Bière de Garde. I found it quite nice with some mild funk, mild sour, and dark fruit flavors all smoothed out nicely by the oak barrels. Though I am not familiar enough with the style to say how well this represents the style I thought it was quite good. Next came the cherry porter, which I was not expecting to like much at all but thanks to the mild amount of cherry I found it pretty drinkable. The mild cherry blended nicely with the roasted malt flavors from the underlying porter, giving it a nice balanced flavor. Next came the 5th Anniversary ale aged in wine barrels. It had a mild tart flavor from the wine barrels with some smooth dark flavors and mild sour cherry. This was surprisingly mellow considering the wine barrels it was aged in. Finally, I tried the Verrückt Weizen, a sour Weizenbock. This beer has won a few awards for the style. Though only mildly tart it puckered the mouth a bit. The tart flavors mixed nicely with dark fruit and malts. This was the most tart of the bunch though still not as tart as some I have tasted. 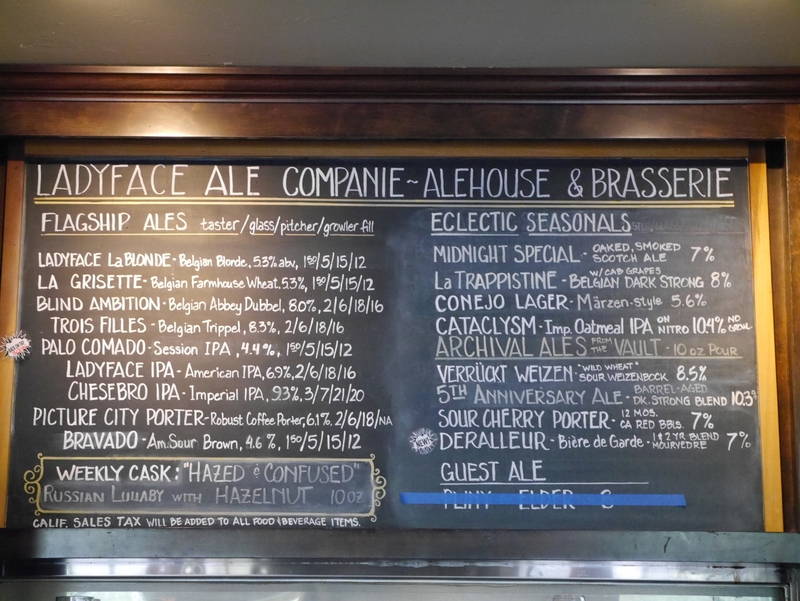 Some time I would like to come back and try some of the core beers they have available but I was glad I tried all of the archival ales this time around. Lady Face is a ways north of Downtown LA so it is an extra drive to get out there. If you are in the area, it is one you should hit for sure.